For all of you who think I've sold my soul to the spinning gods and will never be coming back, rest assured - I am still knitting! Rather a lot lately I might add! I have so many small to medium sized projects going on that I'm having a hard time keeping track of them all. A few are gifts that I'll get to share with you sometime in September, but for now I'll show you a couple of the things that have been brewing in the shadow of the wheel. I can't remember the last time I didn't have something by Elizabeth on my needles. I've learned that this is a pretty solid strategy to have with my knitting. 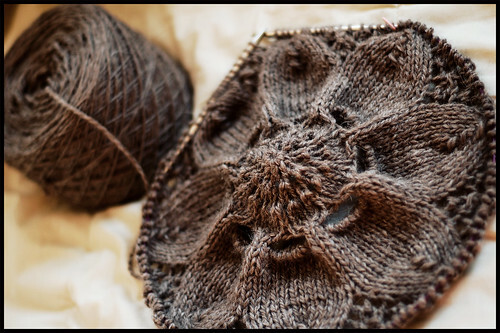 And since I was having some serious chunky-tweed-garter withdrawals after finishing off the Tomten, there was one pattern I had in mind that would be a perfect transition away from the warm tomten nest I spent most of the early summer in. 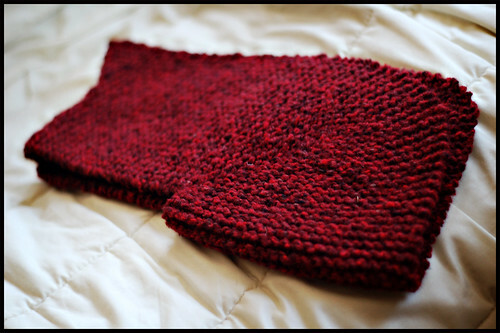 This is one finished half of Liz's Ribwarmer pattern - and I use the term pattern loosely. It's more like a little sneeze on one of the pages of Knitting Workshop. (I like to think that she was so brilliant, even when she sneezed something wonderful came out.) Thank God for the sketch! The Ribwarmer is a short-row shaped vest with a miniature shawl collar worked in two halves that are seamed together down center back (right half pictured above). The pattern calls for a worsted but I had this beautiful Rowan Chunky sitting around harassing me and figured I'd just plug in my modified numbers and get going. It's right about this time in August when I start losing all my patience with summer. I'm ready for the big chill - wool, hats, sweaters and all the other things we knitters live for. I'm pretty tired of relying on the air conditioner to get me through a moviesworth of knitting, or any knitting for that matter. In anticipation of the cooler seasons to come, I've launched into one of the wintry-est things I could think of. A wool afghan. Except it's not so much an afghan as a giant doily made with chunky wool. Awesome. The goal is to transform this old vintage doily pattern into a big wooly throw. We'll see what happens. I'm sure having fun though - those are the biggest holes I've ever put in my knitting - intentionally or otherwise! And the yarn is a yardage dream. There's more things still, but I think I'll need to be sharing in moderation for a bit. The next three weeks will be absolutely crazy. I'm off to London on the 20th of August and have an impossible amount of things to do before I leave.. the most daunting of which is moving. (I'll still be Brooklyn tweed, just another-part-of-Brooklyn tweed.) I'll do my very best to keep the house clean in these parts, so hopefully you won't even notice that I'm going crazy behind the curtain. Hope everyone is well - and happy knitting through the last summer push. Both of those yarn colors just make me drool. What is the afghan/doily yarn? That's particularly appealing. Yikes, good luck with your move. Make friends with someone who owns a van NOW!! I am also knitting a ribwarmer. I have made these before as gifts and they are always a big hit. Love the throw! very cool idea. Can't wait to see how the afghan turns out! The doily is awesome! Have fun in London...it's my favorite city in the whole world. Very jealous over here in Jersey. Hey! There is NOTHING wrong with selling your soul to the spinning gods. (There are worse places you could sell it.) And it will keep you in endless supply of yarn, too. But you knew I'd say that, right? I have been wondering how the ecowool works up. Let us know your opinions on it. Can't wait to see the finished afghan! "It's right about this time in August when I start losing all my patience with summer. I'm ready for the big chill - wool, hats, sweaters and all the other things we knitters live for"
My thoughts exactly! Happy knitting. Your idea for the throw is awesome. I love the flower. I have a feeling your wooly throw is going to be awesome. Just that giant flower is making me want to start one of my own! I can't wait to see how the Wooly Doily turns out! Can't wait to see more of your progress! love the pattern for the afghan. Moving in August! I'll think of you on the 20th going to where I want to be, its my birthday. Hi! New reader to your blog...that doily is gorgeous! It will be exciting to see what you come up with! I can't wait to see your doily turn afghan! That is such a cool idea! Love the afghan idea, cant wait to see how it turns out. Good luck with moving and traveling. I can't wait to see your take on the Ribwarmer. I like the pattern for the afghan. And I love to reed your blog! The afghan-gone-doily is absolutely beautiful. gorgeous stuff! where do you buy your stash? secret online website? i can't wait to see this baby done!!! Can't wait to see your ribwarmer. Loved your pattern in KNITS. Wish I had your knitting motivation. August in drought-scorched SD puts my knitting motivation thru the floor. Your blog gives me inspiration to knit on! I will be eagerly awaiting the next picture of the doily-turned-throw! it's already so gorgeous! I love the idea to knit a doily pattern as a throw. Brilliant! I cannot wait to see the results. The big wooly throw is going to be stunning. OOh, you're traveling to London on my birthday!! Have a coupla drinks on my behalf, wouldya? I love the Rib Warmer Vest and have knit 7 of them. If you get the pattern on a sheet from Schoolhouse press, it tells you how to eliminate the back seam. Once you have done the first half of the short rows for the back, you join the two halves and knit up to the finish. Then I finish off the seaming with a three needle bind off! Wow, that will be a beautiful afghan. I await my IK Fall 2007, as I plan to knit your sweater for myself. Oooh I am drooling over your afghan. What doily pattern are you exploding? Maybe I can get lucky and score a copy of the vintage pattern on e-bay (although I think I might have to fight hard for it if you disclosed). I may have to dig through my vintage patterns to see if I have a knit doily that needs exploding. I know I have plenty of crochet ones, but I'm just too into the knitting thing to even consider those. I love the idea of a Tomten nest. and good luck with the moving. Oooh, I have been wanting to do the same thing to a doily pattern! I can't wait to see how your's turns out. Love your afghan idea. It'll be interesting to see how it unfolds! I just love your giant doily! I'm so excited to see how it turns out. 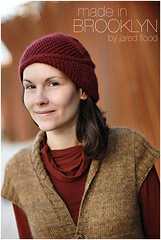 Watching Peg over at Wool-in-my-Soup knit all those rib warmer vests has me itching to make one too. I think a doily as an afghan is a great idea. I'm working on the border of a Frost Flowers and Leaves shawl done in jumper weight instead of laceweight and I'm calling it an afghan too. It's going to be quite big. I had to use 5 circulars in the manner of DPNs to fit all my stitches on the needles. Melbourne, this time of year, would suit you nicely. The cashmere knitting is about the only thing keeping me warm. Such beautiful work, you do. You make me want to drop everything, and just knit for the rest of my life. I'm sick of having hot yarn on my lap on a hot day too. When is it going to cool off?? Good luck with the move! It can be so disruptive but also good. yeah that sounds daunting. i love the ribwarmer. in the pattern there is an example of one with sleeves and stand up collar that is so trendy. yorkshire chunky is wonderful. and though i love knitted garments most i think the big sunflower is so wonderful. great idea with the big needles. lace knitting is all about colour and materials. what a fabulous idea, that doily-afghan-throw-thing!! i completely empathize with being ready for wool weather! it is sweltering here in florida and i persist in knitting wool, hoping to hasten the fall :) good luck with your move. i am moving to new york next sunday... very excited! OK so you're NOT gone yet! I can't promise a finished Cobblestone before you leave, but I might...might...be danged close. It has taken over all other projects. Like oh, say, reassembling the crib. Yep. And from those of us who don't keep things very neat in front of the curtain...well...what else would I write about? I absolutely love that your photo set is called "His Dark Materials." Amazing. Just goes to show that us Brooklynites are incredibly awesome (and have great taste in literature)! I'm loving the Giant Doily/Afghan - what a clever idea! I can't wait to see more of the giant doily! I love big dramatic projects with ecowool! 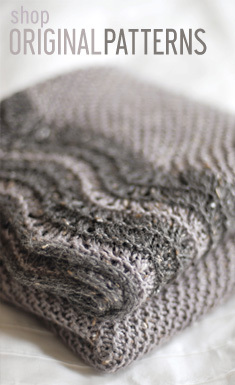 That wooly throw is going to be gorgeous - as is all your knits! love the doily. can't wait to see it finished. You are simply a wonder with the needles!! just out of curiousity, is that one whole skein of ecowool wound up or did you have to break it up into a few cakes? If it is one whole skein in that cake what kind of winder did you use? You really, really amaze me. Can't wait to see what the doily will become, there are so many gorgeous patterns out there but a modern girl only needs so many doilies. I hope the tornado yesterday spared you and your glorious new wheel. ;) Not to mention your inspiring knitting. Seriously, though, I hope you and your family are well. These are like dessert to look at. I can't even imagine what they are to actually work on. Good stuff! Adding a comment a little late - nevertheless, I love the doily afghan. I cannot wait to see how it turns out. Please blog again, I really miss your photos and humor! Love the doily afghan. It was a true conversation starter at my LYS!